You'll hit a winner for sure with the boy personalized Christmas ornament, a tennis gift that is ideal for the holidays or any time at all. These personalized tennis gifts feature the young man's name where shown, but it is hand painted by one of our lettering professionals in a very handsome font along with the year. 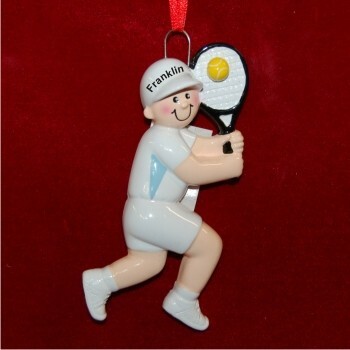 It's one of several good-looking tennis ornaments personalized from Russell Rhodes for boys and men, so you'll enjoy browsing our collection for just the right ones to create a theme. Arriving in our classic velvet gift and storage bag, the men's tennis personalized Christmas ornament is ideal for the tree or his tennis bag.